Preparing and setting out the longline gear. Letting the line soak (fish on the bottom) for one hour while other tasks are performed. 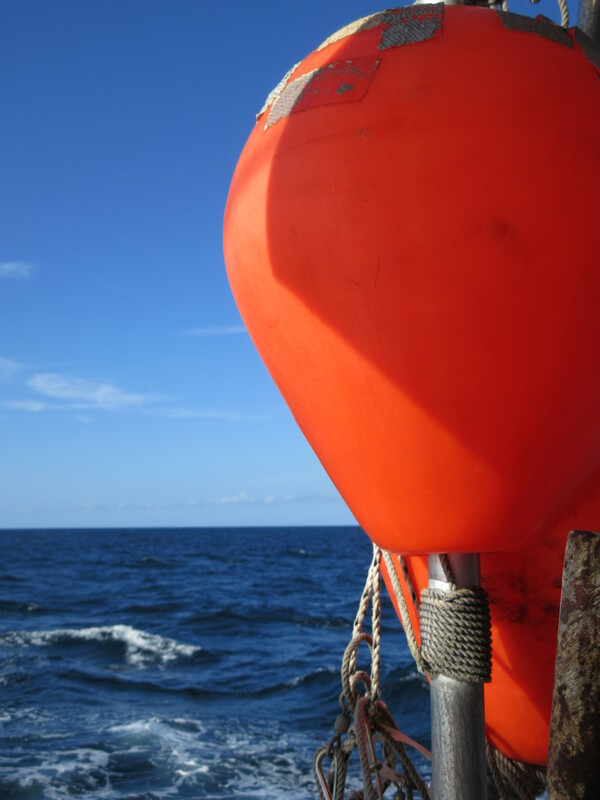 Deploying a CTD (Conductivity Temperature Salinity) to collect samples and information about the water. Hauling back the longline gear. Recording data from the longline set and haulback. Collecting measurements and samples from anything caught on the longline. 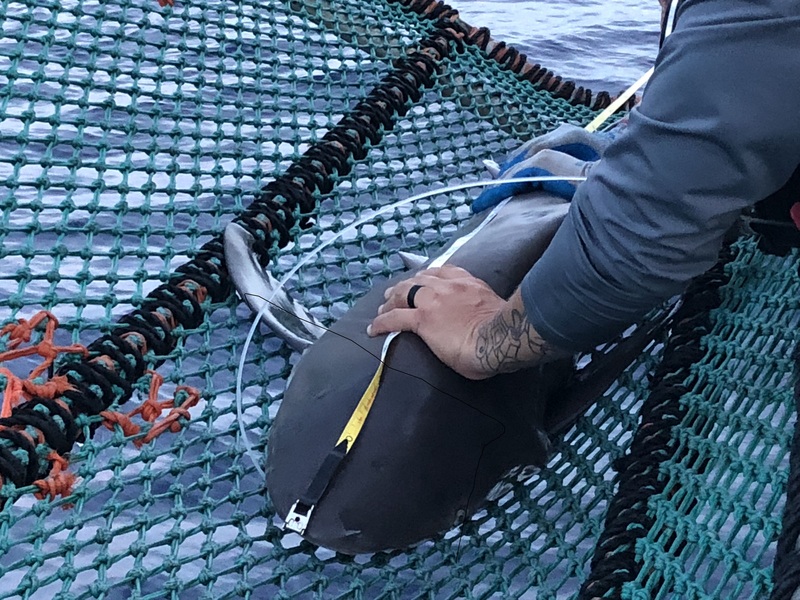 Depending on what is caught: attaching tags and releasing the animal back into the water (sharks) or collecting requested samples for further study (bony fish). This is a very simplified summary of the various activities, and I’ll explore some of the steps in further detail in other posts. Last night, I witnessed and participated in my first longline station. I baited 100 hooks with mackerel. I recorded set and haulback data on the computer as the gear was deployed (set) and hauled back in (haulback). 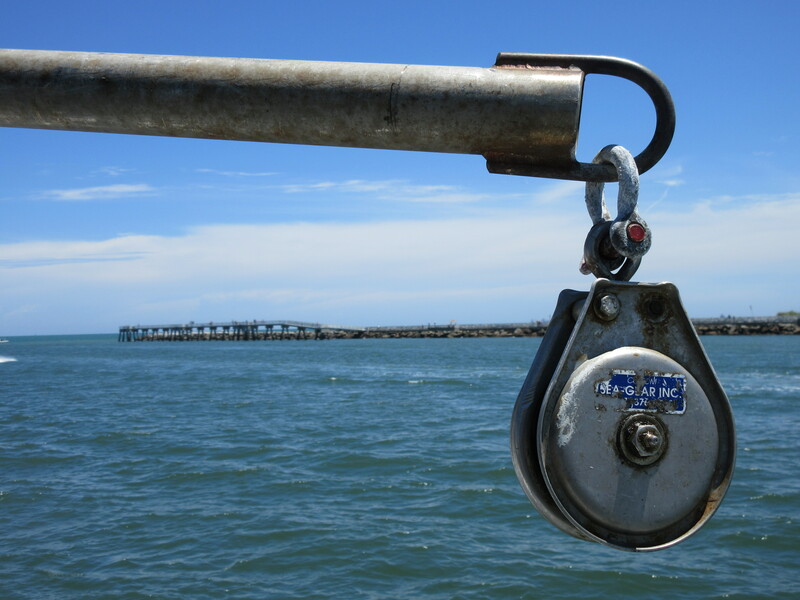 I attached 100 numbered tags to the longline gangions (attached to the hooks). I recorded measurements and other data about SHARKS! We caught, measured, sampled, tagged, and released four sharks last night: a silky, smooth-hound, sandbar, and tiger shark! I’ve never seen any of these species, or types, in person. Seeing the first shark burst onto the deck was a moment I’ll remember for the rest of my life! A sandbar shark being measured on the cradle or sling used for measuring larger, heavier sharks. Sometimes, we didn’t catch any fish, but we did bring up a small piece of coral, brittle sea stars, and a crinoid. All three are marine animals, so I was excited to see them in person. In between stations, there was some downtime to prepare for the next one. One of my favorite moments was watching the GoPro camera footage from the CTD. A camera is attached to the device as it sinks down through the depths to the bottom and back up to the surface again. The camera allowed me to visually ‘dive along’ as it collected water samples and data about the water temperature, salinity, pressure, and other information. Even though I watch ocean documentaries frequently and am used to seeing underwater footage on a screen, this was extremely exciting because the intriguing ecosystem on the screen was just below my feet! Perhaps it is sea lore and superstition, but so far, the journey has been peppered with fortuitous omens. One of my ocean-loving former students and her Disney-bound family just happened to be on my flight to Orlando. Yes, it’s a small world after all. Her work samples were featured in our published case study, reminding me of the importance and impact of ocean literacy education. Very early the next morning, NASA’s promising Parker Solar Probe thunderously left the Sunshine State, hurtling toward the sun. New York’s state motto: Excelsior. Later that morning, a rainbow appeared shortly before the Oregon II left Port Canaveral. Although an old weather proverb states: “rainbow in the morning gives you fair warning,” we’ve had very pleasant weather, and I chose to interpret it as a reassuring sign. Sailing on the Oregon II as a Teacher at Sea is certainly my pot of gold at the end of the rainbow. Now in middle school, celebrating summer! According to seafaring superstition, women on board, whistling, and bananas are supposed to be bad luck on a boat. On the Oregon II, folks do not seem to put much stock into these old beliefs since I’ve encountered all three aboard the ship and still feel very lucky to be here. 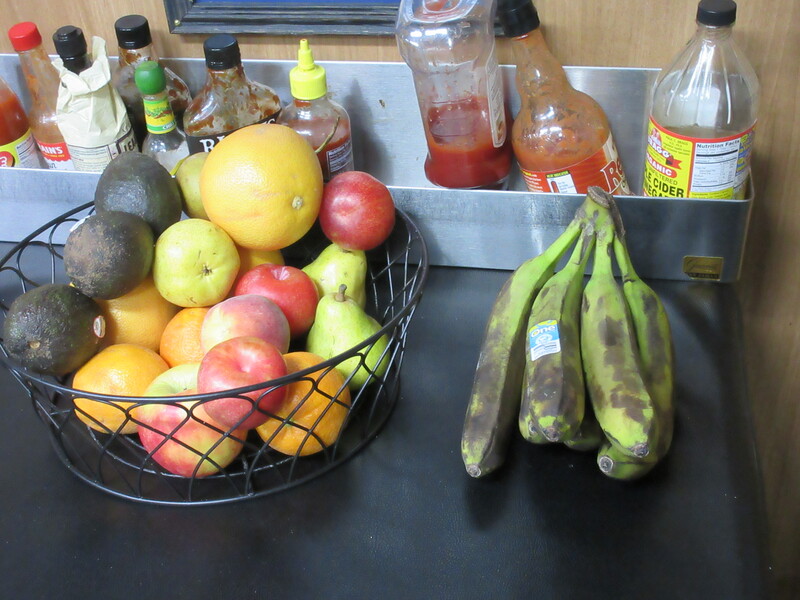 The rest of the fruit seems to think that bananas are bad luck…the crew doesn’t! In another small-world coincidence, two of the volunteers on the Second Leg of the Shark/Red Snapper Longline Survey recently graduated from SUNY Potsdam, my undergrad alma mater. What drew us from the North Country of New York to Southern waters? A collective love of sharks. These small-world coincidences seemed indicate that I was on the right path. Out on the ocean, however, the watery world seems anything but small. The blue vastness and unseen depths fill me with excitement and curiosity, and I cannot wait to learn more. For the next two weeks, the Oregon II will be my floating classroom. Instead of teaching, I am here to learn. As a fourth generation teacher, education is in my blood. One great-grandmother taught in a one-room schoolhouse in 1894. My other great-grandmother was also a teacher and a Potsdam alumna (Class of 1892). As we traverse the Atlantic Ocean, I wonder what my academic ancestors would think of their great-granddaughter following in their footsteps…whilst studying sharks and snapper at sea. Salt water equally runs through my veins. As we steamed, or traveled, to our first station (research location), I wondered about the unfamiliar waters and equipment around me. Before I could indulge my questions about marine life, however, I first needed to focus on the mundane: daily life at sea. In many ways, I was reminded of the first day at a new school. It was junior high all over again, minus the braces and bad bangs. At first, those long-forgotten new school worries resurfaced: What if I get lost? Where is my locker (or, in this case, my stateroom)? What if I forget my schedule? What if I have to sit by myself at lunch? To combat these thoughts, I draw upon a variety of previous travel and life experiences: studying abroad, backpacking, camping, meeting new friends, volunteering, working with a marine science colleague, and sailing on other vessels. Combined, those experiences provided me with the skills to successfully navigate this one. I’ve spent the first few days getting acquainted with the layout, personnel, safety rules, and routines of the Oregon II. My students wondered about some of the same aspects of life at sea. Where do I sleep on the ship? The staterooms remind me of a floating college dorm, only much quieter. I’m sharing a small stateroom with Kristin Hannan, a scientist. We are on opposite work shifts, so one of us is sleeping while the other is working. I am assigned to the day shift (noon to midnight) while she is assigned to the night shift (midnight to noon). Inside the stateroom, we have berths (similar to bunk beds), a sink, and large metal storage cabinets that are used like a closet or dresser. Space is limited on the ship, so it must be used efficiently and sometimes creatively. The view as we leave Port Canaveral. Do you know anyone else on the ship? No, but I’m meeting lots of new people. They have been welcoming, offering interesting information and helpful reminders and pointers. Those first-day-of-school jitters are fading quickly. I didn’t get lost, but I got a bit turned around at first, trying to figure out which deck I needed for the galley (like the ship’s cafeteria), where we eat our meals. And I only had to eat lunch by myself once. On the first day at sea, I made a PB & J sandwich. Eating that, I felt like a kid again (only without my lunchbox), but it was nice to be at a point in my life where I’m confident enough to be all by myself and feel a bit out of place. That’s how you learn and grow. Everything is new to me right now, but with time, it’ll start to make sense. Pretty soon, the equipment and unfamiliar routines will start to feel more familiar. Hopefully, the sharks will like me. The Gulf of Mexico is home to approximately 200 orcas (scientific name: Orcinus orca, also known as killer whales). 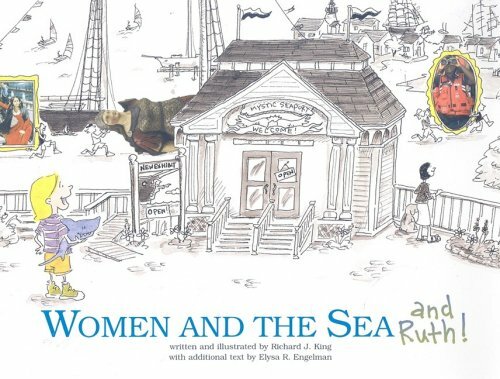 As an introduction to biographies in grades 4 and up, I recommend Women and the Sea and Ruth! written and illustrated by Richard J. King, with additional text by Elysa R. Engelman. Ruth and her stuffed shark explore a maritime history museum, learning about the important roles women have held at sea. Inspired by female sea captains, explorers, and naturalists, Ruth imagines herself in the photographs and paintings, part of an actual exhibit in the Mystic Seaport Museum in Mystic, Connecticut. For more information about the intrepid women featured in the book, brief biographical information is provided at the end. Ruth would no doubt be impressed with the seafaring women (and men) aboard NOAA Ship Oregon II.